The job opportunities are inviting the individuals to get employed in their respective fields by carefully reading and ameliorating the instructions and hit the button of apply if the educational requirements and experiences match the eligibility. 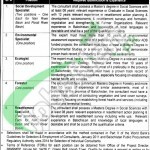 The job opportunities are offered from the Government of Balochistan from the International Development Association in order to maintain the Water Resources through Balochistan Integrated Water Resources Management and Development Company. Various posts are mentioned which includes Social Development Specialist, Environmental Specialist, Ecologist, Forester and Resettlement Specialist. The qualification is Master's degree in the relevant subject is required along with relevant field experience. Lets tap to its further details. Selection will be made according to the method of Part-4 World Bank Guidelines for the selection and employment of the individuals 2011 and according to Balochistan Public Procurement Regulatory Authority Rules 2014. No TA/DA shall be admissible to the candidates. Applications along with C.V and coversing letter should be sent to the Project Director BIWRMD should be submitted on time before end of office time 1630 hours. Last date to apply is 15th January 2016. Last Date to Apply: 15th January 2016.